More Information: This strainer is stainless-steel and shaped into aesthetically pleasing whorls and loops. It is designed to rest on the rim of a mug or cup. You make your tea using loose leaves in a separate container, then pour the mixture through this strainer. 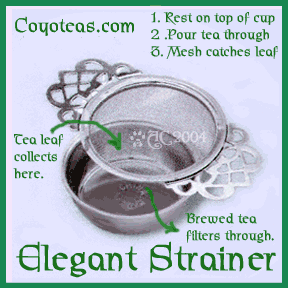 The strainer catches the leaf, leaving only the brewed liquid in your mug. Related Products: Tea bag, Tea infuser. This product first appeared in our catalog on Monday 15 March, 2004.